Yury Viktorovich Fedotov graduated from the Moscow State Institute of International Relations and entered diplomatic service in 1971. Russian being his native language, Mr Fedotov also speaks fluent English and French and has a basic knowledge of German. 2002-2005 - Deputy Minister of Foreign Affairs of the Russian Federation in charge of International Organizations. 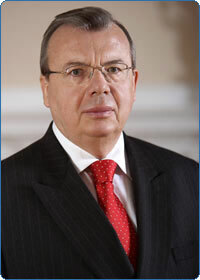 2005-2010 - In June 2005 Mr Fedotov was appointed Ambassador of Russia to the Court of St. James’s (he presented his Credentials to Her Majesty Queen Elizabeth II on July 14, 2005). As a member or head of Russian delegations Ambassador Fedotov took part in many international conferences and fora such as sessions of the UN General Assembly, ECOSOS, UN Commission on Human Rights, UNIDO, UNESCO, WFP, UN ECE, ESCAP etc. In his personal capacity he also served as a member of the College of Commissioners of the UN Commission on Minitoring and Verifications in Iraq (UNMOVIC). Since September 2010 – Executive Director of UN Office for Drugs and Crime and UN Office in Vienna. Ambassador Fedotov holds the title of Honorary Member of the Diplomatic Service of the Russian Federation, he has been awarded The Order of Friendship, several medals and received the Certificate of Appreciation from the President of the Russian Federation. Mr Fedotov was born in 1947, he is married, has a son and a daughter.